The newly released video reveals the demon Hastar, and the video tells us how every generation has got it’s own demon who will have it’s own death. Tumbbad which took 6 years of Sohum’s life has been finally released and not just the critics and audience are loving the film but even people from the industry are talking about it. Be it actors directors, producers or audience. The film premiered at the Venice Film Festival in 2018 and became the first ever Indian Film to open the Critic category at the festival. it is not just Hollywood critics but also Indian audience that are watching the film and applauding the film. Mixing elements of fantasy and horror, ‘Tumbbad’ is a thrilling experience that questions the roots of human greed while providing entertainment. The magnum opus is gaining unprecedented word of mouth on box office. Tumbbad has become a rage amongst twitterati who have been flooding social media about how the film’s production and VFX quality is even better than some of the big Hollywood productions. The reaction of the audiences are ranging from Tumbbad being called one of the greatest films ever made to a film that will be remembered and loved for a very long time. Many have also stated that you will get out of the theatre after watching the film but your soul will remain in Tumbbad for weeks. Even film critics world over have called this Sohum Shah starer a wildly original and never before seen edge of the seat thriller. The film is directed by debutant Rahi Anil Barve and Adesh Prasad and is jointly produced by Sohum Shah, Aanand L. Rai, Mukesh Shah and Amita Shah. As per industry experts, the positive word of mouth has helped the film fetch good numbers. 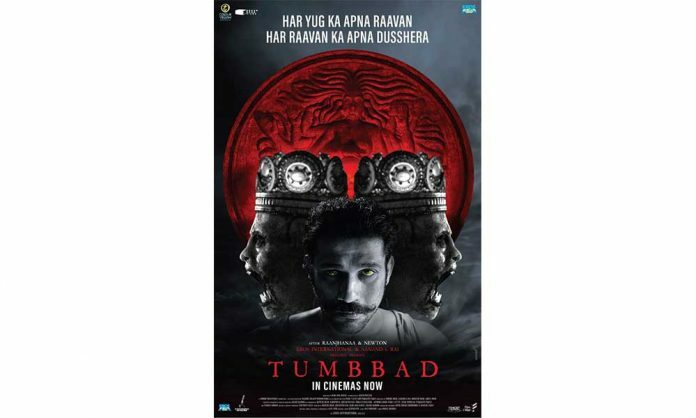 The film has left both the audience and critics gripped and astounded as Tumbbad presents a thrilling mixture of mythology and fantasy with imaginative monsters leaving everyone with a spine-chilling experience. Tumbbad is in cinemas now.